Earlier this year I boosted Werewolf, Kory Heath's iPhone implementation of the cult social-game favorite. Now he's back, with an original iPhone puzzle game. Check it out: a sliding block! Is this madness? Is this 1992? How can I possibly use the word "original" for sliding blocks -- a hoary and overused puzzle format that I've been complaining about since, I think, Heaven and Earth? 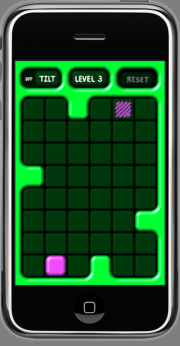 I'm sure you've already recognized this screenshot as the "block slides until it hits something, then you slide it again" variety of puzzle. And that's what Blockhouse is. But seriously. In buckets. In spades. Buckets and buckets of spades. See, you play through a few of these levels, and the little block goes zipping around, and you figure you're done with Blockhouse. Except then you hit the level with two blocks. Then you hit the level with two L-shaped blocks. And they're getting harder. 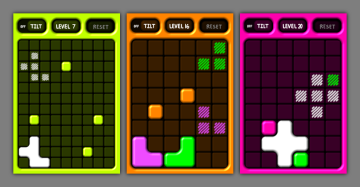 The blocks are turning into zig-zag polyominoes and getting stuck on each other. Occasionally blocks contain other blocks. The interface is minimal and glass-smooth. You don't need a main menu. You don't need a tutorial. The game is in front of you. You play by tilting (or you can turn off tilt-mode, and play by swiping). You don't have to go through the levels sequentially; the game begins with the first 25 levels unlocked, and you can skip around as whim and frustration take you. You do have to complete all of them to unlock the next 25, and so on. I found this to be a reasonable balance between challenge and freedom. Many blocks slide to bring you this information. Use it. "Many blocks slide to bring you this information." I finished them all. Do I get a cookie? 92 is my favorite. It feels like two other puzzles, but requires a completely different solution. I enthusiastically second this review. This has quickly become my favorite finger-fiddly toy while waiting for something to happen, be it a code compile or my lunch prep. The fact that you can jump in immediately and start banging on puzzles makes it more attractive to me than a hundred FlightControls. i recently bought your game "uptown". Unfortunately the rules are in German. Can you send me the English rulebook in pdf-format? I'm afraid this post is about Kory Heath's game (from 2009). It is not a post by Kory.